My posts tend to range from instructive technical articles and product reviews to advice and philosophy, but today’s article is basically a “hey-look-what-I-did!” article. 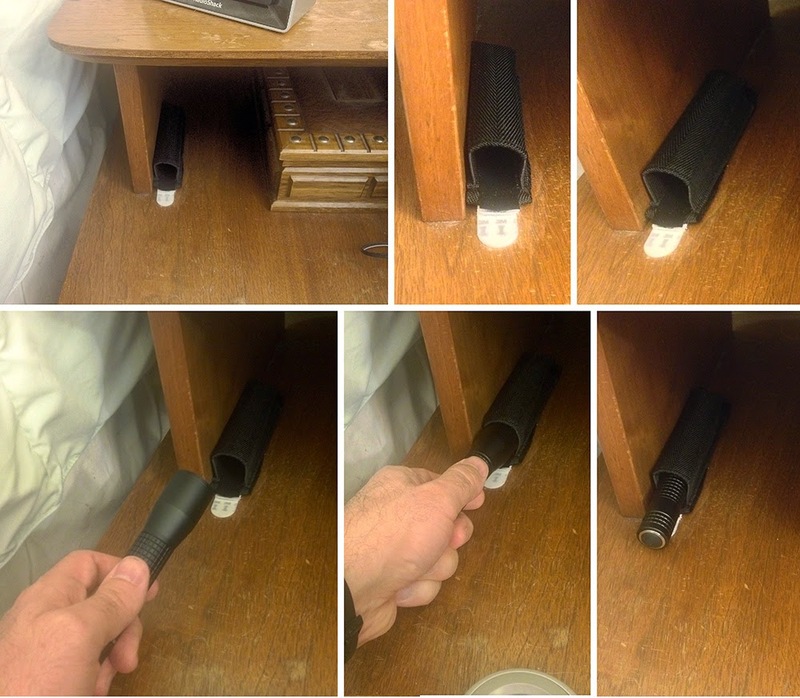 I’ve thought every now and then about the flashlight that I keep near my bed, and wondered if it was a problem that an earthquake could make it fall and roll under the bed, or somewhere else, where it would be difficult to find when needed the most. I have a power failure back-up light in every room, so not having access to the flashlight wouldn’t be that big of a problem if we lost power, but here’s the irony: if we DON’T lose power, then the room will still be dark and I’d like to know where my flashlight is. So a few months ago, I had an idea that was simple enough that it was worth potentially wasting 10 minutes of my time, and it worked so well that I’ll pass along what I did. Basically, I needed to ensure that my flashlight wouldn’t leave the nightstand. If your nightstand has a drawer, that could be all it takes, but not if the drawer can fly out; and if you occasionally use the flashlight for other purposes while a partner is asleep in the bed, the drawer could be noisy. What I did was mind-numbingly simple but surprisingly effective. I had a cheap stretchable fabric belt holster, which came with one of my flashlights, that holds the wider front end of the flashlight snugly but it’s still easy to get it in or out if inserted or removed straight. I stuck a 3M Command Strip (love those things), the kind that adheres until you pull the tab to stretch it and then it lets go, directly to the flat part of the holster, reinforced it with a few staples, and the stuck down the other face of the Command Strip to my nightstand. This thing has been around since the 1960s and the surface is pretty marred up, so if I try to remove the strip one of these days and it doesn’t come off perfectly from the wood, that will be ok; but I will be surprised if the 3M strip leaves marks on the wood. So that the staples won’t scratch up the flashlight (I guess I care more about the flashlight than the nightstand), I took black electrical tape and put a strip on the inside of the flat part to cover the staples, sticking far enough toward the opening that the flashlight can slide along the tape on its way in to the holster. Voila! Now the flashlight lives in the holster as shown in the photo, for me to easily get it whenever I want to use it. Taking it out is simple, and I put it back in the holster by using the front of the flashlight to stretch the opening just a little (see photos above). I just have it in about halfway and it is secure but easily accessible. It’s been there for almost 4 months and the holster has shown no signs of loosening despite using the flashlight each night to take the dog on his nightly before-bed bathroom break. Of course, there are other ways to do this, depending on what you have and how your room is arranged (Velcro, etc. ); but the point is that in an earthquake, you want to know that the light is still there on the nightstand. Now let’s just hope the nightstand is still there by the bed!